Sequel to the animated 2010 hit. How to Train Your Dragon 2 is the latest Dreamworks animated featured, based on the books by British author Cressida Cowell. 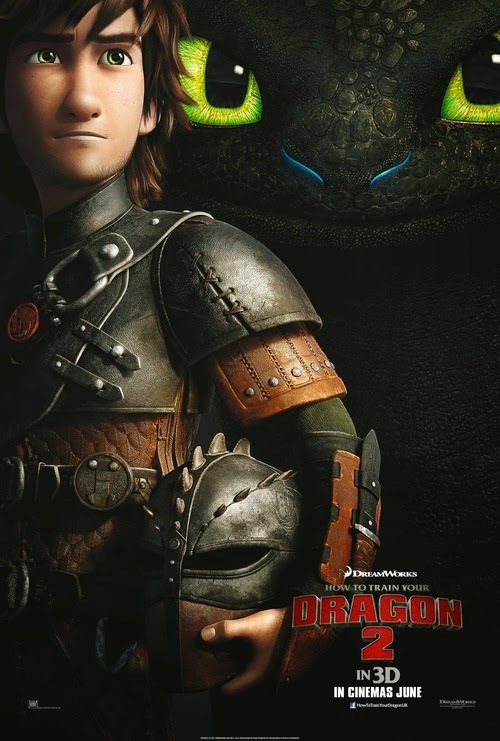 A sequel to the 2010 hit, the movie continues the story of Hiccup and his dragon familiar Toothless (great names!). Hiccup is the son of the chieftain of a Viking village named Berk. Not having seen the first film, I went into this with an open mind, having heard good things about the initial instalment, mainly from adults who, on paper, should have had more sophisticated tastes. The movie was presented in IMAX 3D, to its benefit. The opening sequence involves a frantic Quidditch-style game of Viking youths on their dragon mounts, trying to pluck sheep out of the air (without harming them, of course!). This sets up supporting characters and situations. Dragons are a fully integrated part of the life of the coastal settlement. The design of the creatures is as diverse and vivid as a tropical reef and helps the film-makers establish scale and scope very naturally. Our introduction to the lead, Hiccup, is handled with full fantasy intensity, as he and Toothless take to the skies, exploring and charting the terrains around Berk, in search of new species of dragon and new nesting sites. There’s something very timely in the characterisations: Hiccup is a scientist, effectively a researcher and chronicler of biodiversity. He is also an engineer: he and Toothless both have disabilities. Hiccup is missing his left foot and has contrived a a multi-functional replacement. Toothless is missing a guiding fin on his tail, which Hiccup has also replaced, restoring his companion’s aerial abilities. There is an “A Boy and his Dog” adventure at the heart of this movie, tapping into the same well as the Pokémon franchise, and to a degree the Transformers movies also. The art direction and visual conception of the movie are quite stunning. Toothless presents as the ultimate childhood pet, like a cross between a cat and a gecko with wings, and the finishes to his and all the other creatures and characters’ appearances give the film a palpable quality. The main merit of the 3D presentation is the realness of huge shards of ice, or the weave in the cloth draped over someone. For me, the only place where the film falls down is in the abundance of clichés. Hiccup’s story is a bog standard Hero’s Journey, and while the story is effectively paced to add some dramatic tension, while some characters are introduced effectively and enjoyably, there are no real surprises. The voice cast are clearly enjoying themselves (special commendation to Gerald Butler, who portrays a very simple role with credible authority: he plays the chieftain Stoick, and his voice weds with the character’s blocky design perfectly). If you’re looking for summer movies to entertain the kids, or are in the mood to surrender to an Archetypal story on its own terms, you could do far worse than How to train Your Dragon 2.